This is the cutest ruffle swimsuit and it's under $35. This “heart” cardigan is only $15 - would be cute for Valentine’s Day. This Chloe look alike bag is only $40! This tropical one piece suit is only $18 - and so fun! This floral two piece suit is such a great deal - $10 bottoms and $15 top. These $4 sunglasses look just like a designer pair. This Chloe look - alike O-ring bag is suede and a great deal! These chocolates would make a good gift and the heart box would be cute to display later. These are adorable “heart” flip flops. I have been looking for new socks - and I like these “dotted” ones - almost look like tiny hearts. This oversized “pink” hoodie looks comfy (even if I found it in the men’s section). I was just thinking about your clothing line, and I hate to hear that you hit a snag. I can't wait for you to unveil it! This is such a happy color for spring, and I seriously need that bag in my life. I'm sorry about the garment maker but it's probably best that it happened now before you had tons of orders coming in and no way to fill them! I'm excited to see your line! Wish I was a garment maker because I would create your line! You are brilliant and I know someone out there will pick it up! Ahh every time I see yellow, I think of you! fun outfit you put together! I like the yellow! Sorry to hear you've had a setback with your clothing line. I hope you get it resolved. 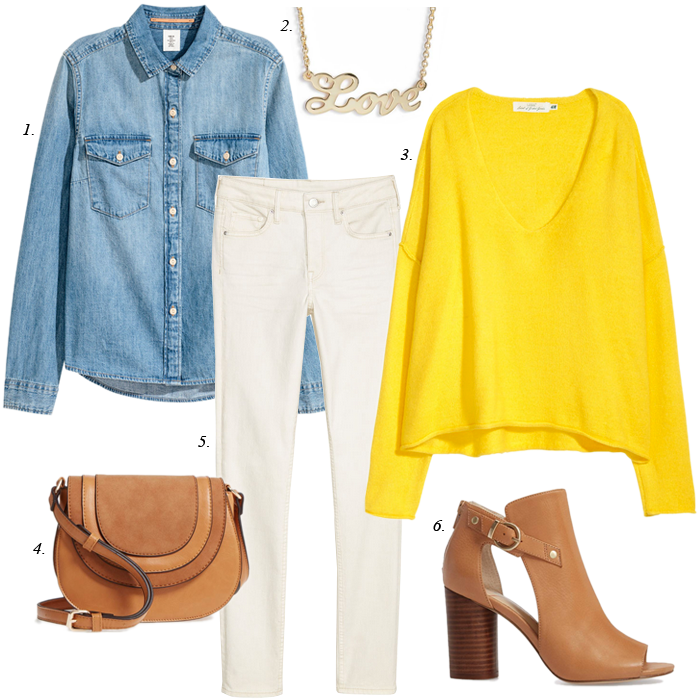 I love the yellow sweater, these colours look so fresh...perfect for Spring! Thanks for linking up!